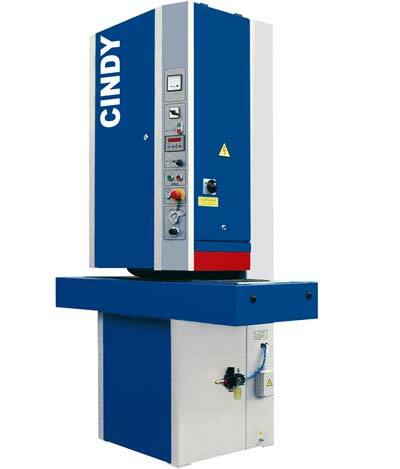 Cindy is a single-opened wide belt machine mostly used for sanding window frames. Currently satisfy as a standard wide belt machine to the width of workpiece 450 mm, so make possible a choice of optimal equipment with a view of persumed use. 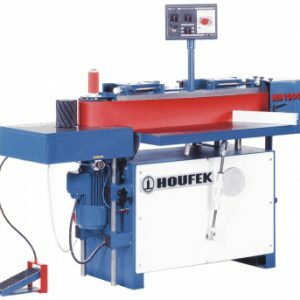 Characteristic is a fixed working table and moving sanding units. For sanding large frames is possible to complete the machine with sliding supporting systems – for safety working with a workpiece. Parameters are approximate depend on the type and configuration of the machine. The operating parameters of the machine and its technological use are characterised mainly by the arrangement and equipping of sanding aggregates. Working aggregates are delivered in the configuration according to the customer’s request. The machine can be equipped with two basic types of aggregates, i.e. R and C type. The R type aggregate is equipped with sanding steel or a rubberised roller. Rollers equipped with a rubber coat can be delivered with the required hardness of coat ranging from 45 to 85 °Sh. The C type aggregate is equipped with a sanding roller and a sanding shoe. The sanding roller can also be delivered as in the case of the R type aggregate, with a steel or rubberised roller with the required hardness ranging from 45 to 85°Sh. Sanding rollers of C and R type aggregate are solid without the possibility to adjust the height. The height of the sanding roller creates the basic height from which measurement is carried out in relation to the position of the working table – height of the workpiece. Since the height of this roller cannot be adjusted, correction of the measured height is carried out in dependence on the thickness of the sanding belt by means of the measuring system. The working height is adjusted by moving up and down of the sanding unit. The working table with a feeding belt is solid. This constructional design of the machine makes possible suitable arrangement of machines into production lines. The sanding shoe for C type aggregates serves for smoothing and fine sanding of surfaces. 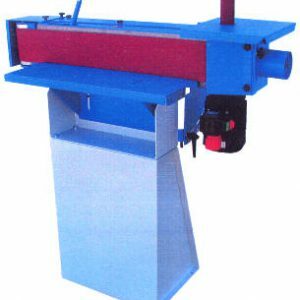 Its contribution is the more advanced ability to copy the surface area of the workpiece and the larger area of contact of the sanding belt with the surface of the workpiece, which makes possible perfect smoothing of surfaces and partial elimination of roughness of the joint of the sanding belt. The sanding shoe is constructed solidly. It is possible to remove the bar of the shoe. The shoe is constructed in such a manner that the graphite layer is placed on a polyurethane or felt pad sealed on the steel profile. The sanding shoe so constructed is suitable for finishing fine sanding of surfaces of monolithic workpieces from and small veneered workpieces equipped with veneer with the thickness of about 0.8 and more. The possibility to use this shoe for sanding of veneer depends on the roughness of the surface and the dimensions of the workpiece (when carrying out calibration of parts before veneering, we can achieve better results). If we exceed the possibilities of flexibility of this shoe for the surface of the workpiece, sanding of the surface will be mainly in higher places of the surface, edges and corners of the workpiece. A decisive role during these defects in sanding using the solid shoe is played by the thickness of the veneer used and its properties. The height of the shoe is set mechanically by means of a hand wheel on the front plate of the sanding machine. The position of the shoe is indicated by an adjustable pointer with a scale. Lifting and falling of the shoe to the working position is carried out by means of a hand wheel. 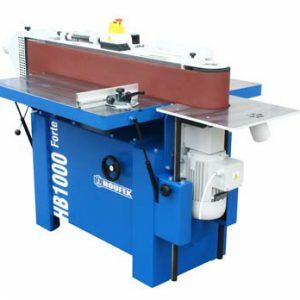 HB1000 Forte is universal edge sander with oscillating belt and high adjustment of sanding unit. 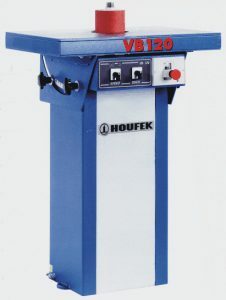 HB 100 Forte is designed for exacting operations with large workpiece. Machine is possible to use for sanding veneered edges, for edges sandig on driving roller or for sandig with sandig rollers of different diameters. 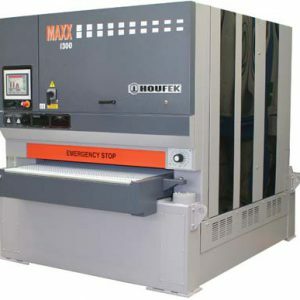 This machine is designed for users demanding high utility value and maximum output. Edge oscilating sander has solid and massive design with many optional accessories according to the customer requirements.